Brooklands frame, 588 barrel, 8 inch rod, bronzed c/case, specially tuned. 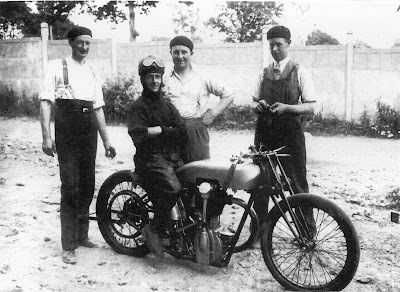 It is virtually certain that this is the machine with which Bert Denly achieved various class world records at Montlhery in July 1928 and a rather indistinct newsprint photo of the team - with George Pearce, Nigel Spring and Pat Driscoll all wearing berets - was discovered by Roger a while back. His more recent contacts with Nigel Spring's grandsons has resulted in a much clearer image and this is attached. Thanks are due to Jonathan and Tim Spring for this interesting and additional part of the Brooklands Norton jigsaw. As can be seen, the machine has had the usual Brooklands Norton treatment of the day with dummy belt rim rear brake and of course no front brake. Actually, the rear wheel set-up looks vaguely incongruous to me but that's a personal viewpoint. The 'taller than usual' power unit is more than apparent while the frame also clearly has longer down tubes. What is not visible is the fact that the engine presumably has bronze crankcases - if one takes the last letter of 'bronzed' as being a clerical error! Roger has previously established to his satisfaction that a few Brooklands Norton power units with bronze c/cases were produced (usually disguised with silver paint!) but I think this may be the first confirmatory reference we have come across in the works records.